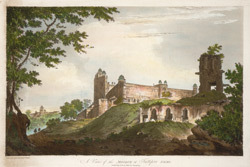 This is plate 12 from William Hodges' book 'Select Views in India'. Fatehpur Sikri was built by the Mughal Emperor Akbar in the 1570s. The palace was abandoned by the time of Hodges' 1782 visit, but its main buildings were still intact. The mosque was built in 1571 and the great gateway on the left of the picture was added in 1576. Hodges found the Mosque a magnificent building designed "in a high style of Moorish architecture".